The spinal market is one of the fastest-growing segments within the orthopedic industry, and perhaps the “last frontier” for machining operations. We believe that concentration of effort is key to being successful as a contract manufacturer in this dynamic, cost-conscious environment. We have the responsiveness and creativity of a small company, but yet the experience to deliver prototypes, customs, and production instruments. After a number of years of partnering with several of the top spinal innovators, we’ve acquired considerable manufacturing expertise, and relish the challenge of working in this rapidly emerging area. In the instrument sector, we have experience with inserters, extractors, scrappers, spreaders, finders, screw drivers, rod benders, tamps, sizers, retractors, and many other customized items. We’re very comfortable with short lead times for scheduled surgeries and high-volume production quantities for product launches. Whether the technology is fusion, motion preservation, dynamic stabilization, or non-fusion, chances are we have experience with the instrumentation. We’re very comfortable dealing with technologically advanced devices for neck and back surgery. Our manufacturing engineers are available to work with spinal design teams to develop the manufacturing process that best fits from a quality and cost-effective perspective. In the future there’s certain to be greater emphasis on more cost-effective treatments and affordable procedures, so it’s our strategy to bring this manufacturing economy to the design discussion. We pride ourselves in providing products and services that exceed our customers’ expectations. Our strategy is to focus on a small number of customers to support their growth. We’re successful only if our customers are meeting the needs of their patients and surgeons. 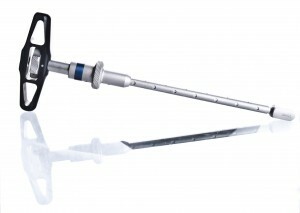 We hope to become your partner in producing the best spinal instruments available. We deliver results!